There’s been a pretty big furore (that’s one of my favourite words) over this song recently. But quite frankly, Janelle Monae’s yoga practice (and from what I’ve read, she has a pretty dedicated one) is her business and hers to talk about/display however she’d like. As is her body. I don’t actually love the song because my tastes lean towards the cheesier side of the pop spectrum but the message that she’s claiming autonomy over her own body? I can be down for that. 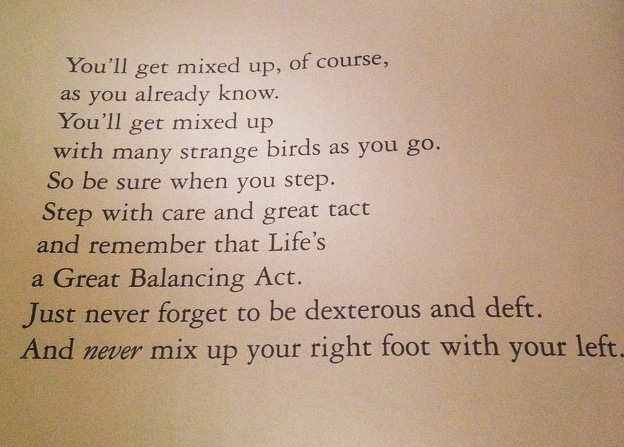 Wise advice for yogis from Dr Seuss there (courtesy of David Kyle’s instagram). But if you’ve ever become completely confounded in twists – or fallen over because you’ve picked up the wrong foot in a complicated transition (hiii), don’t stress – around 20% of the population, according to some guesses, struggle to tell the difference between their left and their right. Scientists are still unsure as to why this is, and mostly it’s a problem easily solved by making an L shape with the fingers and thumb of your left hand. Embarrassingly, I didn’t realise that was possible until a few years further into secondary school than I’d care to admit but it’s a trick that’s saved my face on many many occasions. There’s only so much that can go wrong in yoga though and normally I have very forgiving students but this could be a pretty serious problem if, say, you were a surgeon and you were to perform surgery on the wrong site. More of which on this NYMag article. It turns out, though, that while we don’t know why so high a proportion of the population struggle with their rights and lefts, we do know one of the things that makes our judgment worse – and that’s distraction. I’m not convinced I needed a scientific study (published this month in Medical Education no less) to tell me that – although what I am intrigued by is that apparently medical students think that they have better left/right awareness than they actually do – most of my yoga students are convinced of the absolute opposite. Either med students are more confident in their skills than yogis (possible, although what about the overlap?!) or we’re all being falsely modest. In the interests of svadyaya (yogic self-study), then, I urge you to take this test to discover how good you really are at telling the difference. It’s slightly addictive (and totally SWF, don’t worry!) – bring your results to class and we’ll test you on some twists! My parents often blame the fact I’m an only child on the fact that I would never, ever go to sleep as a baby. Apparently until I was about two the only way they could get me to close my eyes was to put me in the car and drive me around – as soon as the car stopped I’d wake straight up again though so this wasn’t really a great solution. Oops. Love you guys. Things have definitely changed now as there’s pretty much nothing I love more than an early night. Particularly as I’m out of the door at about six most mornings to teach, I try really really hard to be in bed by ten at the latest – obviously there are days when this isn’t possible but generally I’m proud to be a bit of a grandma! I love being an early bird now and find I’m so much more productive and optimistic. There are so many studies out there showing the importance of sleep but this video details one which is totally new to me! It’s so interesting and really worth a watch – especially with the clocks going back this weekend I hope it inspires you to hit the hay a little bit earlier. I was standing around waiting for something the other day (in the interests of full disclosure, when I say ‘something,’ what I mean is for the doors to open at Barry’s) and got chatting to the girl next to me. After a few moments the talk turned to yoga and she said something that I’ve heard before but for some reason stuck in my mind this time – she said “Oh, I’d love to do more yoga but I’m just not flexible enough”. What a massive, massive shame. Here is a woman who clearly wasn’t afraid of a challenge (she was, after all, at Barry’s Bootcamp) but she felt excluded from something which should be welcoming her with open arms because she felt she wasn’t ‘flexible enough’. For one thing, yoga teaches us that actually we are ‘enough’ – in whatever capacity we choose – and that’s been the biggest and most powerful lesson I’ve taken from it personally. But what bothered me here was the fact that this woman didn’t want to do more yoga specifically because she didn’t have the flexibility she thought a yogi needed. We have an image in our heads of people doing yoga and having to put their feet behind their heads (and yes, that’s an action used in a few poses). The thing is, that’s not a particularly useful skill to deploy in day to day life, so it’s fun to work on if you’d like but it’s hardly the ‘point’ of yoga. The reason most of the poses were developed was to give one a greater sense of ease within one’s own body – and increasing flexibility and stretching muscles (particularly ones that have been chronically tightened by modern life) is definitely going to help with that, but only within the limitations of the individual body. The ‘point’, if you like, is the progress – and the feeling at the end of practice – not the aesthetic. If you’ve found a little more space, and a little more comfort, in yourself after a yoga practice then you’re doing it right regardless of how it looks from the outside. And actually, if you do feel stiff and inflexible a lot, then you’re going to gain loads from doing yoga; maybe even more than someone I saw outside a different class doing the splits as a warm up (!). Because the thing is, saying that you’re not flexible enough to do yoga is a bit like saying you’re too hungry to eat. There’s no point only working on the things you can already do! It’s so much more powerful to learn to push your limits – to try something you’ve never tried before – and to let go of the ridiculous thought that not being perfect at something is a reason to not do it at all. I, along with any other teacher worth their salt, don’t care if you can or can’t touch your toes. But we care that it feels good when you try. It’s a balance I struggle to strike – how to sound professional, yet warm/friendly/approachable when I’m sending emails to people I might not know that well. This gmail extension might not be the best way to go about it, but I am so into the idea behind it.